"It's now or never, Kaylan." Cold stone walls towered over the small, striped Kougra, who was currently debating whether to brave the castle or run back to assured safety. Surely no consequences would befall her if she chose the safer option. No one would have known about her visit to this castle, and no harm would come to her if she turned around and went home instead. But if she fled now, she would never know the answer to the question that occupied her mind day and night. Surely it could not be something completely evil. After all, what harm had she done to anyone? What reasons do the faeries have to be so suspicious of her? And for that matter, why had Kaylan's family forbid her from ever visiting this infamous faerie? Both of the Kougra's sisters were dedicated followers of Illusen, Jhudora's supposed nemesis. Kaylan never thought ill of the earth faerie, but she could not help but wonder why her sisters always spent so much time in her glade. Weren't they the least bit curious about the dark faerie? But her sisters would never hear of it; they ignored any questions Kaylan had about Jhudora, refused to discuss anything related to her, and always did their best to steer the young Kougra away from her interest in the dark faerie. Kaylan had never had the chance to visit Jhudora until today, when she was asked to retrieve a few books from the shop in Faerie City. The Kougra had done just that, and fully intended to head straight home—after she paid a visit to that mysterious faerie. She figured it would only take a few minutes; no one would suspect something was amiss if she did not return soon. The young Kougra knew she would be crazy not to take this opportunity that presented itself unexpectedly. Kaylan swallowed nervously as she gazed at her surroundings. Everything about Jhudora's bluff screamed "dark faerie," but that was not necessarily a bad sign. All elemental faeries had opposites; light and dark faeries should be no different than fire and water faeries, or earth and air faeries. At least, that's what the Kougra believed. Kaylan reassured herself that the horrible stories her sisters always told her were simple exaggerations and myths. No faerie quite so terrible would be allowed to live in such a beautiful place as Faerieland, and so close to the queen of the faeries, no less. Deciding that she had wasted enough time already, Kaylan cautiously moved forward and entered the castle. The light immediately grew dim, refusing to go any further into the abode of the dark faerie. Kaylan's footsteps echoed quietly against the bare stone walls, and the hall ahead glowed with a soft mix of green and purple. The Kougra slowly stepped into the fog-filled room to see tendrils of green mist swirling around her body. A shadow formed from the darkness of the room and situated itself in the middle of the fog. "Welcome to my home..." the shadow said with a voice that was both inviting and cold at the same time. The fog retreated back to reveal the infamous dark faerie, who sat elegantly upon an unassuming throne of stone. Kaylan swallowed back her fear and took in a deep breath. Her head held high, she responded to the faerie with a confident tone. "Pleased to meet you, Lady Jhudora." "'Lady,' hmm?" Jhudora asked in an interested tone. "It is not so often that I receive the proper respect I deserve, and from such a bold neopet. Would you care to hear of a deal I have to offer you?" "A-Actually," Kaylan stammered, "I came only to speak with you." "Intriguing. What is it you have to say?" the faerie asked, her eyes narrowing ever so slightly. Jhudora's gaze bore into the Kougra's spirit, staring unblinking as she awaited an answer. Kaylan could feel her confidence falling quickly to the wayside, but she refused to give in to cowardice. She had come this far and approached the faerie she was so fascinated by—she would not let herself turn tail and run now. "Well, Lady Jhudora," Kaylan began, "to put it simply, I want to... know more about you." "Ah, so you came to ask something of me," Jhudora said, her voice turning cold. "You are courageous, perhaps even foolhardy, to come in here and demand something for nothing." The fog tensed around Kaylan's feet, clinging to her fur like shackles. The young Kougra glanced down in a slight panic, but she knew better than to try and run now. "Of-of course not, and I would never dream of making any demands of you. I am just... I am interested in your thoughts, your values! I'm curious about your life, Lady Jhudora." The faerie suddenly let out a laugh that rang like a cracked bell, leaving Kaylan wondering if she had offended her or not. Within an instant, the fog tightened its grip around the Kougra's feet, sending a quick but sharp pain throughout her body. "Curious," Jhudora said. "Such a weak word; it holds no passion, no drive to discover the answers to life's mysteries. A curious neopet would be satisfied to receive a simple 'yes' or 'no' to any questions they had. Those who wish to know more, however..."
Kaylan's heart began to race as the dark faerie leered over her, casting a sinister shadow over the small neopet. "...they will pursue the answers," Jhudora continued, "no matter what the cost." The young pet nodded quickly; her voice caught in her throat and refused to come out to respond. "I will give you a chance, however," the faerie said. "A chance to prove your worth to me, and a chance to receive the information you desire. All I will ask is that you bring me one specific item every day. I care not how you obtain it, so long as I have it before your time is up. If you do this for me, I will reward you well for your efforts, and should you complete enough tasks without failing me even once..."
Kaylan looked down at her feet to find that the fog had lessened its grip, and the pain had begun to subside. She breathed a sigh of relief and looked up at the faerie with rapt attention. "...you may find the answers you seek," Jhudora said. The striped pet bowed her head, grateful to have such an opportunity. "You will not be disappointed, Lady Jhudora," Kaylan said. "Whatever it is you ask of me, I will bring it to you without fail." "That is what I like to hear," the faerie said with a crooked smile. "Now, for your first task..."
Kaylan left the castle in a slight daze, her eyes staring ahead vacantly for several moments before snapping back into reality. She suddenly remembered that she was being timed, and with a dedicated force, the Kougra dashed off to retrieve the first item. Thoughts of Kaylan's sisters swam through her mind briefly. They would be infuriated to learn that she had gone against their wills and spoken to this dark faerie, but the Kougra put the worry out of her mind and instead focused on the task at hand. Her owner kept a well-stocked bank account—plenty of neopoints to afford whatever it is Jhudora may ask of her. Kaylan knew that the first few items would come cheap, and no one would miss a few neopoints here and there. However, as she would be asked to retrieve more expensive items along the way, Kaylan would need to come up with a reason as to why she was spending so much. But she would worry about that when the time came. The neopet rushed into the shop that held the item she was looking for, and she grabbed and paid for it without so much as a hello to the shopkeeper. With the item in hand, Kaylan raced back to Jhudora's castle as quickly as she could, paying no mind to the occasional pet she bumped into or faerie she brushed aside. Giving forth a final burst of speed, Kaylan dashed into Jhudora's throne room and respectfully placed the item before her feet. Heavy breaths fell to the floor and parted the green fog, while the dark faerie stood from her throne to pick up the item. "Well done, young neopet," Jhudora said with a warm voice. "You have brought me what I asked for, and with four minutes to spare. Here is a small trinket for your troubles. Come back tomorrow and I will have another task for you." The faerie dropped a strange lollypop in front of the Kougra, who finally caught her breath and stared at the prize in wonder. She quickly picked it up and placed it into her pack, giving a formal bow to the dark faerie before leaving her wake. When sunlight entered Kaylan's vision once again, she stopped in front of the castle and began to vacantly stare ahead as she had before. This time, however, a smile crept onto her face, and then a giggle escaped her throat, and soon, a laugh of genuine happiness spread through the trees that surrounded the castle. "What an amazing deal," Kaylan whispered to herself. "To think that I will actually be able to learn something about her! Simply incredible!" The young Kougra beamed as she began her race back home, a sense of accomplishment spreading warmth throughout her body. Her sisters would never need to know anything. A very cross green Shoyru stood in the middle of a well-furnished living room, her foot tapping impatiently against the white tiled floor. The house remained silent for a few moments and, sensing that nobody was responding to her call, the Shoyru shouted even louder. "Kaylan, get out here NOW!" A door creaked open at the end of a hallway, and after a few moments, the striped Kougra trudged into the living room. "What do you want, Glasi?" Kaylan asked, her face clearly showing disinterest in whatever her sister wanted of her. "What I want is for you to explain your sudden increase in spending habits! Do you even know how many neopoints you've taken out in the past month?" "Why does it matter? Mom isn't going to run out anytime soon." "That's not my point," Glasi said. "You've taken millions out of her account! You're making withdrawals every day, yet you never come home with anything—no new paint job, clothes, toys, or anything! Where is all the money going?" Kaylan could feel her heart rate quicken slightly, but she maintained her apathetic composure as she answered her sister. "I've been, uh, donating to the Money Tree. And—and making wishes at the wishing well." "The wishing well?" Glasi asked. "Why would you even bother with that? You know we have the funds to afford most of whatever it is you want." "I wished for world peace," Kaylan stated simply. Glasi blinked at her sister, unable to come up with a response for a few moments. She studied the Kougra's face intensely, trying to discern her true motives. "I don't buy that, Kaylan," the Shoyru said. "You've never been known for your generosity before, and there's no way you've been throwing away millions of neopoints for nothing. Now, tell me the truth." Anger began to form on Kaylan's face, and her claws stuck out to scrape against the floor. "What have you ever done to prove yourself responsible for Mira and me? Why should I have to explain everything to you? You've never even answered some of my questions before, so why should I not do the same to you right now?" "What questions?" Glasi asked. "When have I not..."
Glasi's voice trailed off as the realization of the truth dawned upon her. The Shoyru's face fell from anger to grimness, then back to anger, and then bordering on furious. "You've been visiting her, haven't you?" Glasi accused with an icy voice. Kaylan said nothing to her sister, merely staring with narrowed eyes and a firm jaw. "I should have known there was something suspicious about your daily absences," Glasi continued. "You've been off running quests for that evil faerie! Mira! Mira, come in here quickly!" A shadow Acara poked her head through the door to the living room, confusion apparent on her face. She approached her shouting sister and, immediately sensing something was wrong, gave Kaylan a look of slight worry. "What is all the noise about, Glasi?" Mira asked. "Do you know where Kaylan has been spending all of the missing money recently?" Fed up with her sister's yelling, Kaylan shouted back in a burst of rage. "YES! 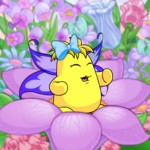 I've been doing quests for Jhudora!!" The Kougra gritted her teeth and tensed her muscles. "And I will continue to do so because you two do not dictate my life!" Mira's face fell in shock, while Glasi seethed quietly with rage. For a while, nothing was said, and the air hung over the family like a smothering blanket. Suddenly, the Shoyru felt a nudge against her right shoulder. "Glasi," Mira said quietly, "is it okay if I speak to Kaylan alone?" "Fine!" Glasi shouted back, startling the Acara. "Be my guest! As if that traitor will ever listen to me!" The Shoyru flew out of the living room in a huff, slamming the door shut behind her. The impact rattled the walls of the house and left a stunning quietness behind. After a few moments, Mira spoke up to break the silence. "Kaylan... you know Glasi cares about you, right?" Mira asked in a quiet tone. "I care about you too." Kaylan scoffed, but said nothing. "We just want you to be safe," Mira continued. "Nobody knows what that faerie will do one day, and you certainly can't be sure she won't turn against you one day." "You don't know that," Kaylan retorted. "Just because she's a dark faerie does not mean she is inherently evil." "...She's more than just a dark faerie," Mira whispered. "Right. Well, glad we could have that enlightening conversation," Kaylan replied sarcastically. "If you'll excuse me, I'm going to bed, and I better not hear about this in the morning." Without waiting for a reply from her sister, Kaylan swiftly turned away and retreated back into her room, slamming the door as loudly as Glasi had done earlier. Mira let out a long, defeated sigh and headed for her own room, quietly shutting the door behind her. After nearly two months of continuous questing, Kaylan at last placed the final item before Jhudora's throne. The green fog danced around the Kougra, curling around her feet in a way that almost resembled happiness. The dark faerie picked up the magical item and wrapped her wicked fingers around it, eyes gleaming with satisfaction. She looked down on the neopet with a smile as she tucked the item away and held her right hand out. With a puff of purple smoke, another item appeared in her hand, and the faerie gently placed it before the Kougra. "This is the Wand of the Dark Faerie," Jhudora said. "You will not find another weapon so powerful, and very few of these exist in the world. Know that when you wield it, you will wield it in my name, and you will have the unstoppable might of my power. Treasure it, dear pet." Kaylan stared at the wand in awe, the words failing to come to her mouth at first. "I... my Lady Jhudora, I thank you greatly for this treasure. I have never been particularly strong, but with this..."
The Kougra's voice trailed off, and she gave a most humble bow before the faerie. "My dear Kaylan," Jhudora said, "you have worked so hard for my benefit. I think it is now acceptable for me to confide in you. Raise your head, come closer to me, and I will tell you everything..."
The fog swirled and danced around the Kougra and the faerie, quickly expanding and filling the room as the two came closer to each other, until all that could be seen was a veil of bright green. In the twilight of the day, the front door of a neohome opened with a quiet creak. A striped Kougra strode confidently into the home, delicately closing the door behind her. A shadow Acara, who had been napping on the couch, woke up in sleepy confusion to glance at her sister. "Hey, Kaylan," Mira mumbled. "Everything okay?" Kaylan approached her sister and smiled sweetly, placing a paw over the Acara's head. "Everything is wonderful, dear Mira," Kaylan said. "You can go back to sleep." Mira's eyes fluttered shut, and Kaylan removed her paw to head to her own room. She stopped in the threshold of the hallway and chuckled to herself. 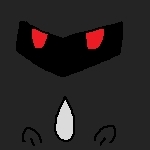 Starring Black_Knight_Zero_00 the Tonu! Z belongs to horntailz.